Frédéric Malle was such a fabulous speaker and a real presence in Barney's dank perfume basement. He has actual star appeal. A young man asked Frédéric his thoughts about layering. At first he said, "I only recommend it if the person doing the layering is very skilled." Then he said he's smelled many attempts at layering and "they're never very skilled. It always smells awful." He explained how skilled his perfumers are, how much time it takes to create a perfume, how complex the creations are, and how they deserve to stand alone. Then he brought up Escentric Molecules, how that line is making money by presenting a single popular ingredient, they aren't truly perfumes, and he dismissively said, "If you want to layer those, I suppose it's fine." 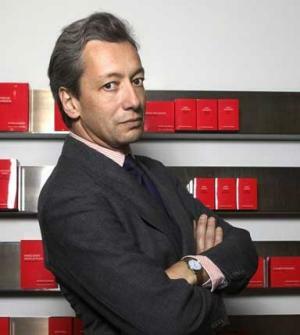 He came back to proper perfumes and said he's "generally opposed to layering." Then he paused and said, "I'm very opposed to it." Frédéric Malle: not opposed to layering his arms. Frédéric made a special point to say that when his perfumes require some slight modification, he ALWAYS involves the original perfumer. He said it at least twice and, at first, I thought it was strange to emphasize such a thing, that of course he'd involve the original perfumer. Then I remembered that recent Grain de Musc post about fragrance houses bastardizing formulas of their established perfumes in order to retain ownership. When someone buys a bottle of Dior Homme, s/he would rightfully assume it's Dior Homme by Olivier Polge, and not a reformulation by someone else. In the larger scheme of things, the world has more pressing problems, but this sort of thing makes me a little angry. And, once again, Frédéric Malle has emerged a hero. A hero in a blue linen suit. What a thing. Because I was so charmed by the whole event, I bought two bottles: En Passant for my friend Diane (for letting me drag her along) and L'Eau d'Hiver for me (for letting me drag me along). "not opposed to layering his arms" just cracked me up! I also think layering is generally A Bad Idea. Would you superimpose Starry Night on top of the Mona Lisa? I think not. Vanessa, I'm with you and Fred re the general too-muchness of layering. That Jo Malone strategy of claiming their line is suitable for layering seems designed to layer their pockets more than anything else. I always liken it to sloshing a Shiraz and a Chardonnay into the same glass - they're complete compositions on their own, one can't willy-nilly throw them together and expect something nice to come out of it. It's a different story with single note oils, though, and in fact, that's how the ancients used to perfume themselves: sage oil behind the ear, rose on the neck, myrrh on the belly, and so on. Kym! You were a tuberose/gardenia/jasmine layer cake! I've done the same thing at marathon spritzing sessions with all incenses or all roses. I will concede that there are also those "Hey! You got chocolate in my peanut butter!" surprises when whatever's still clinging to your clothes blends beautifully with whatever new fume has just been applied. I've got a cardigan steeped in lingering Bruno Acampora Musc that seems to play nice with other random SOTDs. Brian, not only would I not superimpose Starry Night on top of Mona Lisa, I wouldn't slap Dogs Playing Poker on top of Elvis, Marilyn Monroe and James Dean at the Diner. Schlock over schlock smells just as bad as masterpieces on top of masterpieces. I'm always trying to keep up with so much stuff that I end up layering in spite of myself -- one on each hand, wrist, elbow, etc. Would never dream of layering a Malle fragrance though -- such a look he has! Yeah, you don't want to run into Fred in a dark alley behind Barneys after layering Carnal Flower with Musc Ravageur. The Gallic stink eye could be lethal. i love this! i personally am a perfume purist, and i feel like a perfume should stand on it's own merits and not need layering to help it out. i know, that's not the point of layering, but it's how i feel dang it! Kym: You must have smelled divine! Vanessa: I'm glad that I'm not the only one who cracked up at M.Malle's layered arms. Brian: Do you consider layering acceptable with Slurpees? Would M. Malle approve? I do not have the answer to this question. Am I the only person who's going to stick up for the general okayness of occasional layering? Granted, I only do it with scents that aren't unassailable masterpieces in their own right. But any cheap floral + Tea Rose is usually pretty good. You're not the only one, Elisa -- Kym likes her quintuple-decker gardenias, and I do stumble onto serendipitous combos myself. And yeah, Tea Rose is surprisingly gorgeous with many things. In one of my perfume collection videos, I had a Tea Rose epiphany on camera when it smelled delectable against Miller Harris Fleur Oriental. You just reminded me of that! I'd add to your equation by saying incense + Tea Rose smells pretty good. Well what else is Malle going to say. For him to suggest layering would be acceptable would be like the Garanimals sales lady to suggest you could mix the tiger tags with the bear tags. Banish the thought! The outfits are only outfits if the tags match! They cannot possibly be improved! Of course layering is ok. It's just fragrance people. Wear it any way you like. Mix it up. Don't get all precious about it. silverflux, the Loulou review potential is certainly there. I've been exploring it with great interest lately. I missed it the first time around. So glad you're watching/reading/smelling.